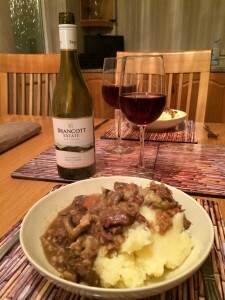 We enjoyed a home-made warming beef stew that was perfect for a November evening. 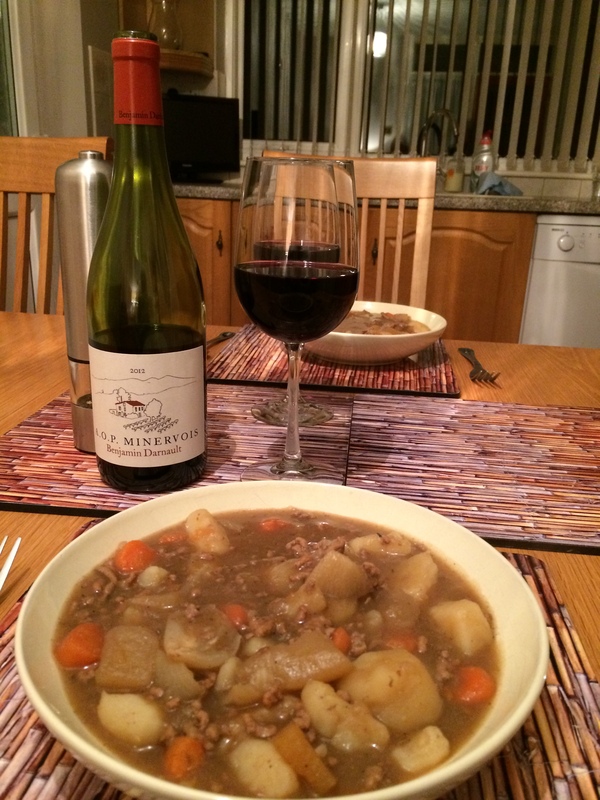 We cooked minced beef with carrots, turnip, swedes, potatoes, onion, beef stock , bouquet garni, bay leaves and basil. Lighter stews like this often pair well with medium-bodied French reds and so we opened a bottle of Benjamin Darnault Minervois 2012, a southern French red blend of Grenache and Syrah from Naked Wines. 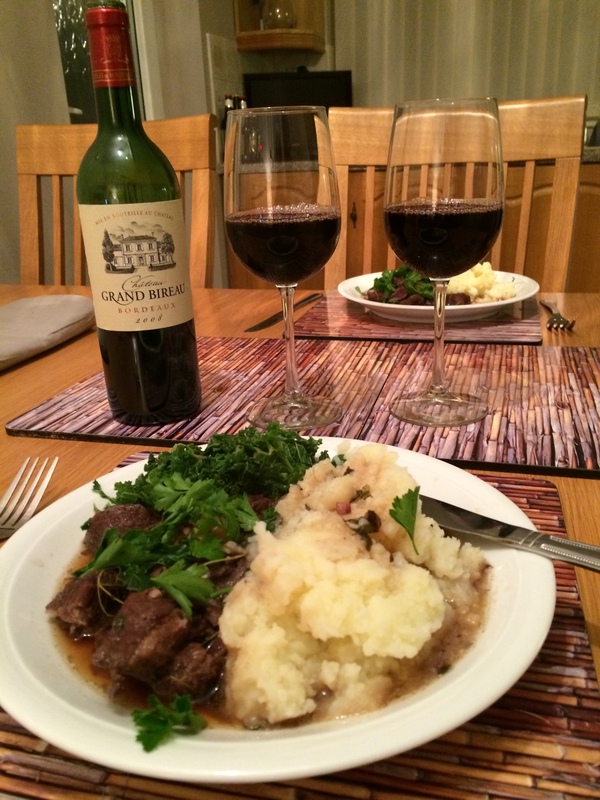 We enjoyed the wine’s red fruits and a slight sweetness that had an affinity with the root vegetables. There was also a little spiciness on the finish. We thought the wine was a very good match with the stew. 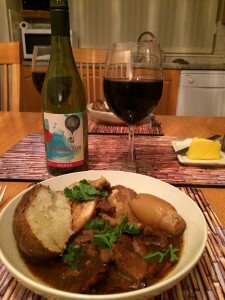 Nautical Stew from Supercook might sound like a fish recipe, but it’s a simply-prepared beef stew ideal for those cooking in a yachting galley, or people like me who wanted to cook something with minimal preparation while the wife was away. Stewing beef is simmered on the hob with onions, paprika, canned tomatoes, baked beans, brandy and fresh sliced red pepper, not tinned as in the recipe. I served it with garlic bread. 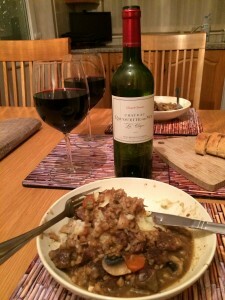 I opened a bottle of Lidl Minervois 2012, a medium-bodied French red blend of Syrah and Grenache. It was juicy with raspberry and blackcurrant fruits and some spiciness. 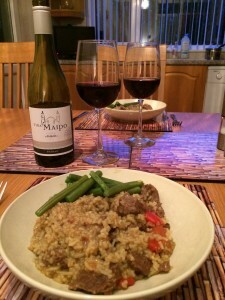 A good match with the meal. We enjoyed a favourite Goulasch recipe from Supercook. 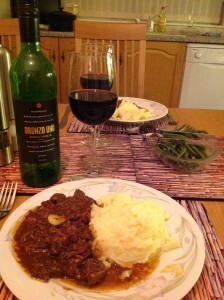 It is beef stewing steak cooked with onions, garlic, paprika, bay leaf, potatoes and sour cream and is simple and easy to make. 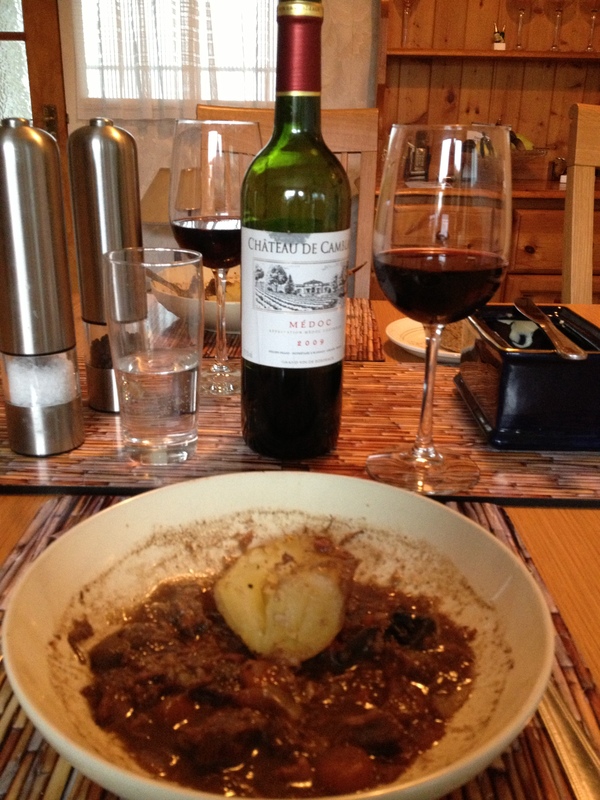 We have found Merlots often go well with Goulasch and opened a bottle of The Society’s Chilean Merlot 2011, a full bodied red from the Wine Society. 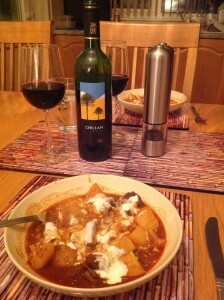 The wine was very smooth with dark plum fruits, vanilla sweetness, with an underlying spiciness that complemented the stew. A very good match. 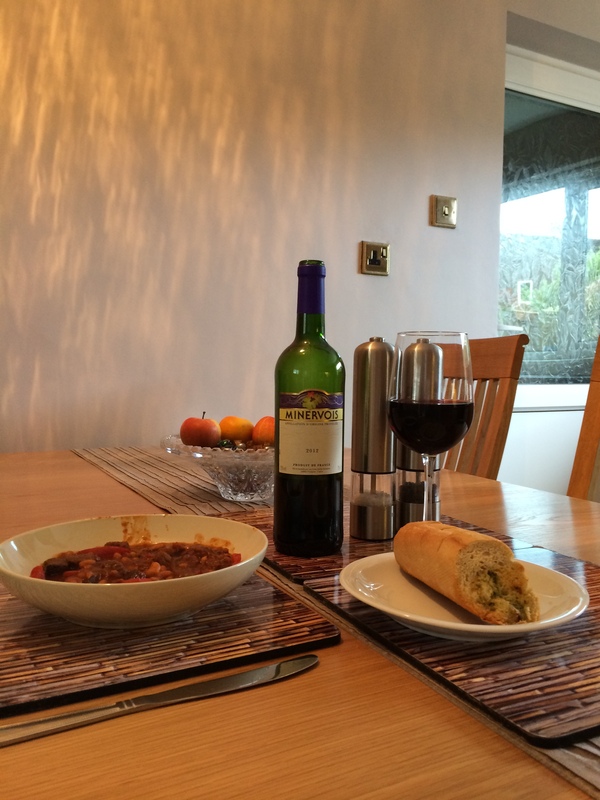 We had friends to stay for the weekend and cooked one of our favourite recipes from the Slow Cook Book – Tuscan Beef Stew. We served this lovely peppery stew with mashed potatoes and green beans. See here for a full description of the stew and a Tuscan red that was a perfect pairing with it. This time we tried an Italian red blend brought by our guests – Oronzo Uno Rosso Puglia 2009, from Virgin Wines. This was smooth with plums, red cherry fruits and vanilla. One of our guests detected damsons. The wine was a good match with the meal. 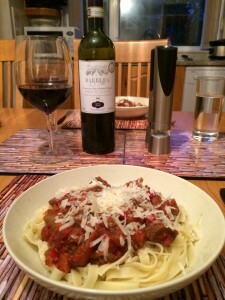 We also opened a bottle of Saracosa Rosso di Toscana 2009, a Tuscan Sangiovese from the Sunday Times Wine Club. 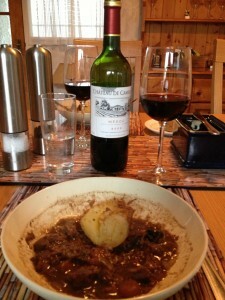 As before, we enjoyed its smooth black fruits and spiciness and also detected chocolate. A lovely match.